Ryze is a mobile platform that provides guest amenities in an outsource basis to hotels and Airbnb’s that do not provide them. So things like room service, mini bars, and concierge services. Cofounders Nachiketa Rao and Morgane Le Bleis, as travelers themselves and staying in various hotels and Airbnb’s, realized that one of the confusing things for travelers in New York is making a decision on where to stay, which takes a lot of time-consuming research. There is also the obvious fact that room service in high-end hotels tend to be very expensive. “What makes us different is that we have an interface that is a one-stop shop for travelers,” says Le Bleis. Boutique hotels, for example, often do not have the basic hospitality services that high-end hotels do. Adding these services helps them be a real hotel, while saving money. Meanwhile, high-end hotels may have these services anyway, but would like to have Ryze as an alternate, if their own services are not being used by guests. iPads are placed in hotel lobbies with the web browser opened to Ryze’s interface. Travelers can sign in and begin to use these services. The interface is also customizable according to the hotel’s preference. The dashboard is also flexible, so if the hotel wishes to interchange one of the services for something else, they can. For example, forgoing a mini bar and replacing it with a different service. For room service, Ryze partners with private chefs, who receive a commission on the food that they make, which enables a reasonably high gross margins on food sales. Most of their chefs focus on providing local, organic, and healthy meals from a selective menu, so that customers don’t spend too much time trying to pick a meal. For other services such as laundry, they partner with other startups. 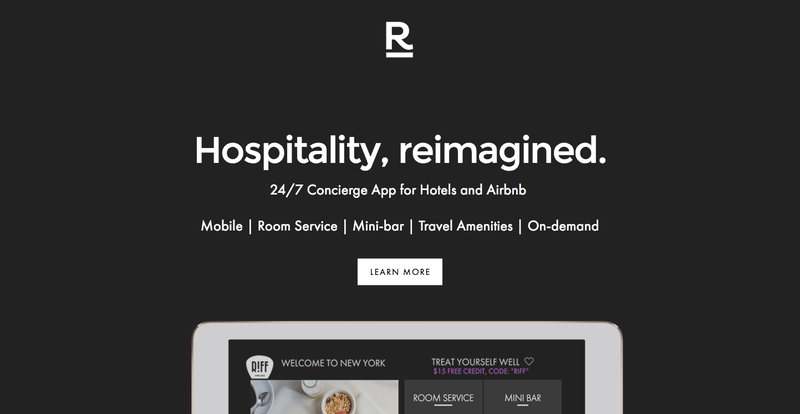 “What we’ve created is an entire ecosystem of hospitality services that are curated,” says Rao. Rao and Le Bleis had no tech background and taught themselves to code and design the interface for Ryze. Since launching four weeks ago, Ryze is already working with eight hotels, nine Airbnb superhosts, and two corporate rental platforms. And within those weeks, they have already reached over 1,500 potential customers. Rao and Le Bleis have also won two awards from the Wharton Business School at the University of Pennsylvania since launching Ryze.